The run across the USA has had it's obvious benefits not only for the 2 charities but to me personally. The charity fund currently sits at just over £87,200 which is a quite remarkable sign of so many people's generosity. As for me, I lost 77 pounds and 22 % body fat during the run. I also feel that I've got significantly greater mental strength than I had before I started the run. I'm already looking into the feasibility of the next big run. The mental strength that I referred to will be put to the test in what I believe would be a very difficult event if I can ever figure out the logistics. You might think that the benefits end there. You'd be wrong. What has become apparent during my experience of running across the USA this Summer and also from John O'Groats to Lands End in 2007 is how the run has inspired other people. I received the following email yesterday which I thought I'd share with the readers of this blog. It's very touching and, for me, makes what I do even more worthwhile. "I am an American who was born in Suffolk at RAF Lakenheath. I attended university in Brighton in 1996/97, the year I became a Newcastle United supporter (Les Ferdinand, David Ginola, Alan Shearer... how could anyone not support that team??). I now have a family and live and work in Seattle, Washington. On the same day you set out to complete your run across the United States, I left my home in Seattle for Bangkok, Thailand. My father was a retired serviceman who lived in Bangkok for about ten years. He was diagnosed with colon cancer in November 2009 and he stayed in Thailand to receive treatment. He was just about at the end when I left my home to be with him, just about the same time you were running out of New Jersey for Coney Island. He finally died last Saturday (August 20th). My sister was there with us for a while, but she had to return to the states just a few days before he died, so most of the time it was just him and me, and maybe a nurse in the room. I was his only son, the oldest, and was responsible for making some tough medical decisions once he lost the ability to continue fighting. Obviously, I'd known this was coming. In some ways, I was better prepared for the end than my father was himself. I prepared myself by speaking with friends who'd lost parents or siblings and I was fortunate to become friends with an oncologist who lives in my neighborhood. One other thing supported me during the last and most difficult months of my father's life: I'd been following your run since you set out from Huntington Beach. Sometimes I checked your blog two or three times per day, often feeling like a hanger-on, but nevertheless I enjoyed keeping track of your progress. I finally donated today -- only a modest ten pounds but honestly, given the travel and time away over the last month, it was all I could afford. If I could give more, I would. Because I derived an immeasurable amount of pleasure from following your run and reading your updates. I really needed the positive feelings associated with your success and I thank you wholeheartedly for doing what you did. Honestly, I know it wasn't the point of the run, but I can't thank you enough for doing it. It was inspirational on a lot of levels, and a demonstration of selflessness and determination that makes me think a lot about what I'm doing with my life and what I'm going to do from here on out, both for me and for my family. Best of luck to you. I hope the Geordie Ball is as successful as your run across the country here. 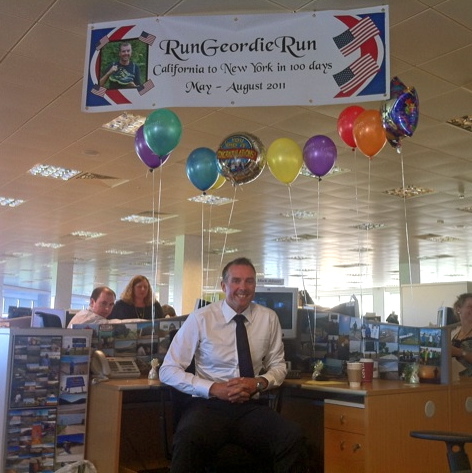 It's been a quite fantastic week in terms of organising the Run Geordie Run ball. Mrs Run Geordie Run has played an absolute blinder and is working tirelessly, almost around the clock, to make the event a success. The ball is very close to a sell out and we will be contacting The Marriott at Gosforth Park over the weekend to try and arrange some more tables. In the meantime, let me take you through the itinerary for the evening. I'll be delighted to see so many folk there and it promises to be an absolutely brilliant evening of entertainment and fund raising. At 7pm, there'll be a champagne reception on arrival with what I like to call the "Run Geordie Run Dolly Dealers' super raffle" for both ladies and gents. While you enjoy your Champers, please watch out for the Run Geordie Run "Dolly Dealers*" selling apples and sweety bracelets. Each one of them will have a number attached and up for grabs is a Pandora Bracelet if you bought a sweety bracelet and an iPad 2 if you bought an apple. There'll also be a chance to view the items in the "Run Geordie Run Super Silent Auction". There are some amazing items on offer and please feel free to bid on anything that takes your fancy. The silent auction will run throughout the night so it'll be worth returning to the table to make sure you're the highest bidder. You won't want to miss out on these items. *actual Dolly Dealers may differ slightly from those shown below. The evening will really get underway when the Run Geordie Run Dolly Dealers dance for us on stage. This will tell us that "dinner is served". They were cheaper than a dinner gong! I have worked tirelessly with the Dollys over recent weeks. They are now lucky enough to have some of my "signature dance moves" in their locker. I'm hoping they put everything they've learned in our intensive choreography sessions to good use. Just before we take our seats for a superb 3 course meal with an American twist, your hosts for the evening, Real Radio's Gary and Lisa, will squeeze in a quick game of "heads and tails" with a nice magnum of bubbly up for grabs. The Breakfast Show duo will be on hand during the night for our entertainment and to remind everyone what the evening has to offer. On the tables will be envelopes for each person. In exchange for a donation, at your discretion, you'll be entered into the Run Geordie Run Super Table Raffle. So many kind folk have donated so many superb prizes that I wouldn't be surprised if we all went home with a bit of something*. I have worked closely with the Marriott, Gosforth Park to fine tune this unique one off menu. I'm sure it'll go down a treat. I had to endure many tasting sessions before I was 100% happy with the menu. 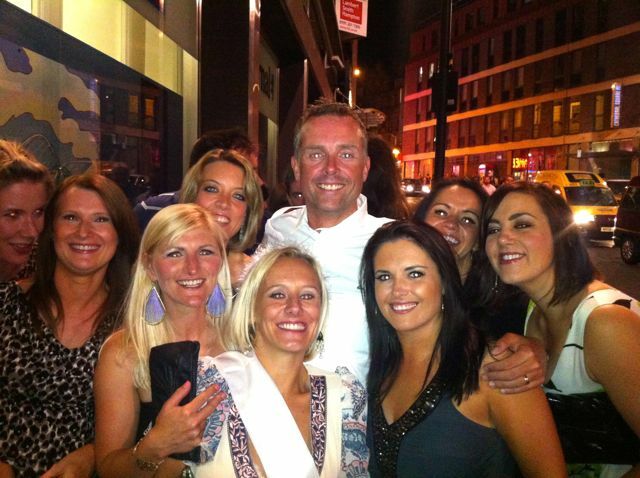 That is the main reason I started the run across the USA at 18 1/2 stone (see below). Yes ladies and gents, I risked it all to have the perfect menu delivered to you. But that's just the kind of guy I am/was! A comprehensive choice of wine will be available to you on the table. It's a good idea to pre order this and the relevant forms to help you do this will be sent out with tickets next week. 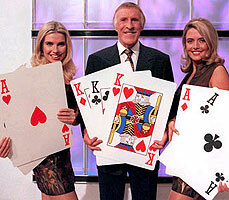 Located at the rear of the room will be the Run Geordie Run Super Casino. It is here that you will be able to purchase your "Run Geordie Run Super Dollars". The dollars can be used to win your fortune on the Blackjack or Roulette tables. The person cashing in the most dollars at the end of the night will win a 32 inch LCD TV. It's a colour one too! Quit while you're ahead or go for broke? The choice is yours. You might want to check how your bid is doing on the Run Geordie Run Super Silent Auction. We wouldn't want anyone going home disappointed! *Please note - Run Geordie Run Dolly Dealers are not on the Run Geordie Run Super Raffle prize list but they will be collecting your envelopes. 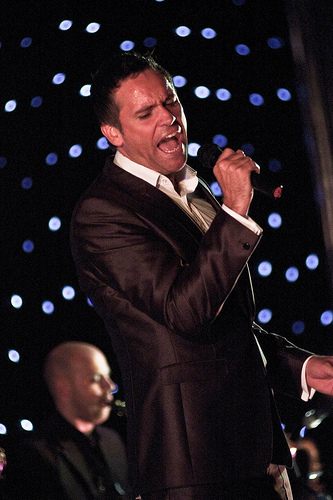 Jason Isaacs backed by his 3 fantastic vocalists and the big band that is The Greg Francis Orchestra will take to the stage after dinner. He'll belt out hit after hit in a style that only Jason or Sinatra before him could deliver. Fans of Jason will know exactly what I mean. Listen out for a few surprise songs that will deliver a taste of my memories of the USA. And before you ask "What's that coming over the hill, is it a monster?" isn't one of those songs! I've saved a special pair of the underpants I wore when running across the USA to throw at Jason on stage*. That'll be his cue to bring his first amazing set to a close. But worry not folks as he'll appear later on for his second set (if he hasn't been suffocated by my pants that is! Don't worry I've taken out special insurance!). *That reminds me! I must get Mrs Run Geordie Run to launder said underpants before next week. Once we've got our breath back (and more to the point, Jason after that underpant episode!) it's time to get down to business. This will be my chance to take you through the whirlwind journey across the USA. I'll be explaining just how I managed to run 3100 miles across the USA in 100 days and exactly why I did such a foolish thing. More importantly, I'll have the chance to thank everyone who made, not only that possible, but also helped to raise such a fantastic sum of money for St Benedict's Hospice and The Children's Foundation. I wrote the speech for this section in my mind while running across the USA. To deliver it to such a wonderfully supportive audience is going to be an absolute honour and a privilege. This is going to be a very profound, personal and emotional thing for me to do so please bear with me as I attempt to keep it together on stage*. I'll also be dropping a massive hint as to what the next big running challenge is going to be. Not even Mrs Run Geordie Run knows what that is! I've promised not to touch a drop of alcohol until after this part of the evening is over. We don't want a repeat of my post John O'Groats to Lands End speech in 2007 where I became a cross between Bernard Manning and Frankie Howard. There were sharp intakes of breath from the audience that night where I expected laughter. So please, instead of buying me a beer**, pop the money into the table raffle envelope or buy a few extra Run Geordie Run dollars for the Run Geordie Run Super Casino. *I'm sure that with the help of the Run Geordie Run Dolly Dealers I'll manage! **up until that point of the evening! It's fine thereafter. In fact, you're playing catchup! Up for grabs in the Run Geordie Run Super Auction are some absolutely fabulous prizes. Breakfast show funny man, Gary Phillipson will be our auctioneer for the evening and he will be ably assisted by the much funnier Lisa Shaw. 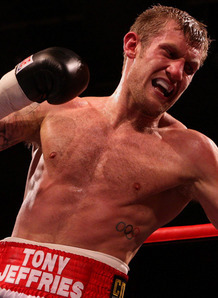 Fancy going 3 sparring rounds with professional Boxer Tony Jeffries? You can bid for that here. Fancy a champagne lunch followed by a tour round the Bentley Factory? You can bid for that here. Fancy a swimming master class with Team GB's Double Commonwealth Champion, British Record holder, Commonwealth Record holder, World Medallist, European Medallist and Olympic Finalist Chris Cook? You can bid for that here. Fancy a pair of my sweaty old trainers used to run across the USA? You can bid for that here. No really you can! Fancy a framed Run Geordie Run running top that was worn in the USA? You can bid for that here. Also up for grabs is a fantastic framed Team GB item from Paralympian Stephen Miller who will be present on the night with his family. There are a few other superb items too and I'll be publishing a full list a few days before the ball. I'll also publish the list of prizes for the Run Geordie Run Super Table Raffle at the same time. Speaking of which, once the auction has finished, Run Geordie Run Junior will draw the numbers out for the table raffle. I'm sure that'll go smoothly and once everyone has got their prizes it'll be time for (the resuscitated) Jason Isaacs to take to the stage for his final set of the evening. Jason, The Greg Francis Orchestra and those fabulous backing singers will once again take to the stage and whip the audience into a dancing frenzy. Just remember not to dance to "My Way" as you would "The Lady is a tramp" or one of those other upbeat numbers. I'm sure to be in demand* so you'll find me swapping partners and cutting in like there's no tomorrow during Jason's final set of the evening. The names of the winners of the Run Geordie Run Super Silent Auction and the Run Geordie Run Super Casino will be on display by the end of Jason's 2nd set. You might want to book a bigger taxi! *Once again, the Run Geordie Run Dolly Dealers will be on hand if I'm by myself. Well that'll be it for another year or so. Where did the evening go? How did I end up winning so many prizes? And why do I have 2 Run Geordie Run Dolly Dealers in my taxi? Those and many other questions will surely be answered by the end of the Run Geordie Run Charity Ball. It's going to be a blast. We are hopefully going to raise a significant sum of money for St Benedict's Hospice and The Children's Foundation. It'll hopefully be the kind of money that really makes a difference to the already fantastic services offered by the 2 charities. They are desperate for our hard earned cash. Let's make it a great night for the 2 charities. Let's have a bloody good time too! As I said at the top of this post, the Run Geordie Run ball is almost sold out. If you would like to attend then please don't delay. Payment for tickets (£65 each or £600 for a table of 10) can be made by Debit/Credit Card to the Marriott or by bank transfer. 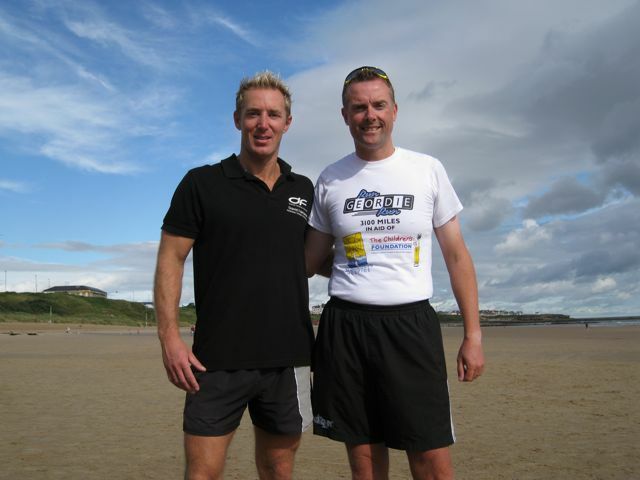 Please get in touch at sponsorship@rungeordierun.com if you would like to book some tickets. Alternatively, please use the link below. One of the main reasons I made it across the USA without injury was the Brooks running shoes that I wear. They served me well over 874 miles from John O'Groats to Lands End in 2007. This continued this year with a successful 3100 miles across the USA. 2800 of those miles were ran in Brooks Glycerin 8 and when the need for a trail shoe arose, Brooks Cascadia 6 was used. I finished off the last few hundred miles running in Brooks Glycerin 9 (pictured below). I bought my own Brooks shoes back in 2007 and was delighted when they agreed to become my official shoe supplier for the run across the USA. Without their support I would have been faced with buying 18 pairs of running shoes over the last 3 years! I wouldn't have worn any other shoe so I'm grateful to Brooks for helping to keep my costs down. As well as Brooks shoes, I also wore Brooks Equilibrium base layers for the majority of the run. I've been a fan of this product for the last 3 years. It's one of the most comfortable base layers I've worn. I wrote the following for a magazine last year - "During the Summer of 2007 I ran 874 miles from John O’Groats to Lands End in Brooks trainers, raising £34,108 for St Benedict’s Hospice. Since then, I have clocked up almost 2800 miles wearing out 6 pairs of Brooks shoes. The thing I like most about my Brooks shoes are how comfortable they are. I remember when I first tried a pair on in Northern Runner in Newcastle. “Wow! They feel like slippers!” I remember thinking. I’ve tried a few different brands that, at the time I found very comfortable. In my experience, Brooks have taken comfort to the next level. Saying that they are comfortable in the shop is one thing, however. I spent the next 2 months testing them out before deciding to use them to run from John O’Groats to Lands End. The experts tell me that I’m a neutral runner, so Brooks Glycerin are the model of shoe that I use. In fact, I’m currently running in the Brooks Glycerin 8 model which incorporates Brooks own DNA technology for the first time. Brooks DNA is “an innovative cushioning material that responds to the unique differences that make each of us who we are as runners.”. 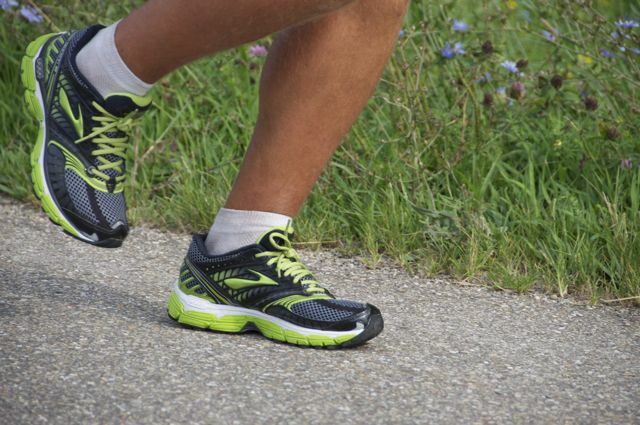 In laypersons terms, a special fluid is used in key parts of the shoe, which adapts, in the runner’s favour, to the different forces that are applied to it. I find this particularly useful as my training is made up of various speeds (7:30 - 11:00 minute miles), distances (5 - 37 miles) and terrains (Roads, cycle paths and the treadmill). I’ve also been known to lose and gain 2-3 stone between major events so I reckon Brooks DNA works overtime some days! On Sunday 19th September, miles 2750 - 2763.1 at the Great North Run were the usual comfortable, blister free experience. This was my first comeback race following an ankle break in May 2010. An ankle break which made the front page of the local newspaper incidentally. I was on a cycle ride along the C2C route with friends who call themselves “The Men Of Steel”. Unfortunately, 120 miles into the ride, I had a puncture in my front tyre on a bend and lost control. My inner ankle bone (Medial Malleolus) was the casualty of the resulting fall. I suspected straight away that it was broken. “Thankfully”, it was a nice clean break. Only 24 hours after the accident I had 2 pins inserted in my ankle at Newcastle General Hospital. The recovery from the ankle break meant 3 months of missed running time. So with only 2 weeks of training under my belt and going against my physio’s orders, I finished the Great North Run in a time of 02:22:48. The run provided a massive boost in confidence and served as the first stepping stone to the next major run I’ll be undertaking. 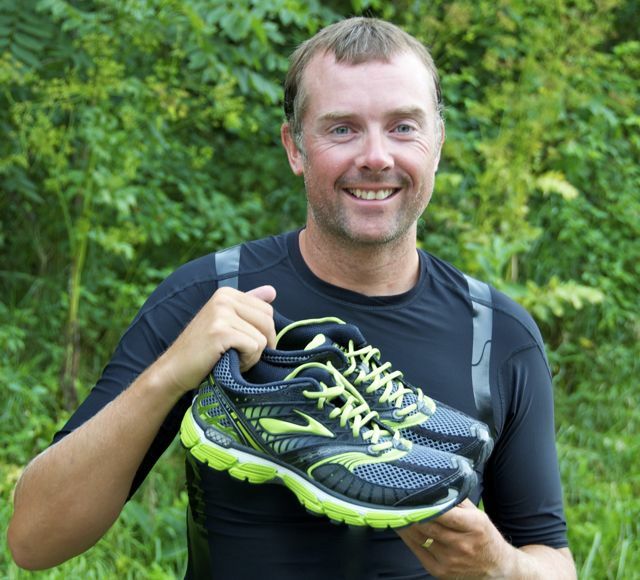 For 100 days during the Summer of 2011, I will be continuing to put my faith in Brooks Glycerin shoes when I run 3100 miles across the USA from California to New York. That’s an average of 31 miles per day for 100 days and 3.5 times further than my John O’Groats to Lands End run in 2007. I’ll be counting on the Brooks DNA technology, in my Glycerin shoes, to adapt to terrain of the Mojave Desert as well as the Rocky Mountains and beyond! This article may read like a sales pitch but it is in fact a plea for all readers to, at least, try a pair of Brooks shoes. I’ve had a lot of comfort and success in them over the last 3 years. It’s imperative that that continues and I get to New York in 1 piece in order to raise the target of £50,000 for 2 local charities; St Benedict’s Hospice (Charity No. 1019410) and The Children’s Foundation (Charity No. 1000013). Thanks to my Brooks Glycerin shoes I stand a very good chance of succeeding.". Thanks to Brooks for their brilliant support over the last 3 years. I'm not the usual kind of "athlete" supported by Sport Newcastle. I was therefore very grateful and, indeed, flattered when they became one of my kit sponsors. By having the Sport Newcastle logo on my kit not only did the 2 charities benefit financially from the deal but I had a respected local brand emblazoned on the right hand side of my chest during the run across the USA. It's clearly visible on my favourite image of the entire run below. In the their words - "Sport Newcastle are a voluntary organisation that have been working in Newcastle for over forty years. Their aim is to encourage the development of sport in the City by offering funding opportunities to men, women and children seeking to realise their sporting dream. Whether backing community projects or local clubs, elite international athletes or individuals of regional repute, we try to promote success through sport. They currently operate a Sports Scholarship scheme in partnership with local companies and individuals which allows eleven talented local athletes receive sponsorship to help them achieve their sporting ambitions. These include Olympic hopeful athletes Ryan McLeod and Lauren Dewdney, Swimmer Jessica Thielman, Gymnast Grace Imeson, Judo Player Louise Little and Basketball Player and Newcastle Eagle Ross Wilson. In addition to the scholarship scheme individual grant applications are considered four times a year by a committee of Trustees. 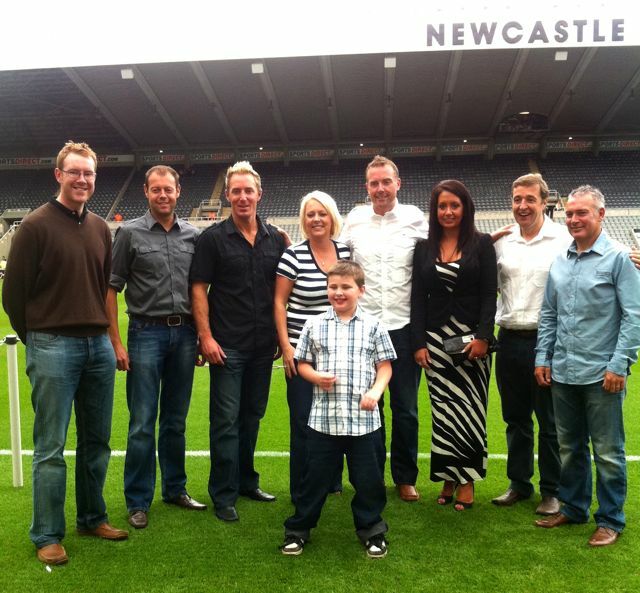 Sport Newcastle are run by a committee of volunteers working under chairman Alan Younger. If you are able to support Sport Newcastle in any way please contact Malcolm Dix 07718 448057 or (0191) 267 6342 or visit the website www.sportnewcastle.org.uk". Thanks to Sport Newcastle for their support of Run Geordie Run and then 2 charities. It's just over 2 weeks since I finished the run across the USA. The relief of having successfully finished the run and the utter amazement at the amount raised is still very much the feeling that I have. There is no real sense of achievement or perspective yet. Perhaps that will come after the Run Geordie Run Ball next week when the final fundraising total is known. Physically, I feel in brilliant condition. My feet are on the mend thanks to the continuing treatment by Alison at the Cradlewell Clinic. I've really had my eyes opened as to how you treat the kind of damage that my feet have. It's not just a case of removing dead skin and clipping misshaped toenails. I've had to endure very deep massage on my legs in order to correct some issues in my feet. It's excrutiating! It really is. I'm also wearing strategically placed padded dressings on both feet in order to encourage blood flow to my metatarsals. I'm hopeful of running again next week but I'll be taking advice from Alison before making my return. Last weekend's stay at Slaley Hall was just what the Dr ordered. I had a good session in the gym and Mrs Run Geordie Run and I had a nice relaxing time in the pool. The evening meal that we had was some of the best food I've had in years. It was very healthy too! Honest! I've worked extremely hard at getting my food right since I returned to the UK. I can't remember ever turning down a full English Breakfast before. 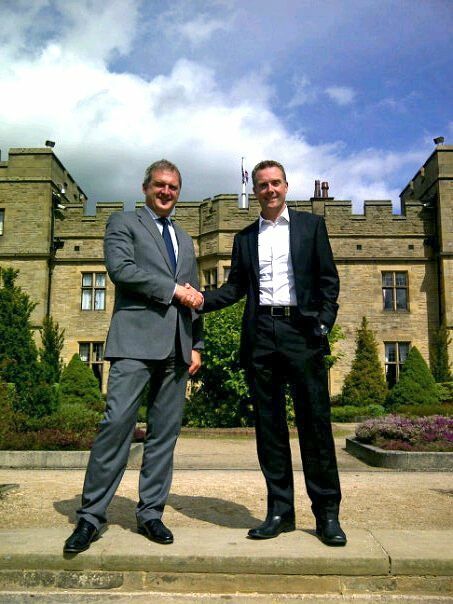 That was the case at Slaley Hall! I've not had a chocolate bar since I came back to the UK. Off the menu is also fast food and takeaways. I'm an ambassador for The Great Fitness Revolution for goodness sake! How on earth can I ever step inside another chippy again! Out of habit I still make the trip to the shop at work. I now come away with an apple though. My diet now consists mainly of lean meat, salad and vegetables. I've started to have a bigger breakfast too. Porridge, of course, is always on the menu. I've had a few omelettes here and there too. It takes a little longer to have breakfast before work but making that time in order to get a good start to the day is so important. As for the fundraising; I continue to be amazed more and more each day as the donations keep being made to St Benedict's Hospice and The Children's Foundation. The fund burst through the 86k barrier this evening and currently sits at £86,028. That's 141,890 US Dollars or 10.8 million Japanese Yen (which sounds very impressive!). I received a nice Tweet from @HannahTurley tonight - "[you] became a topic of conversation at the dinner table tonight Mark! Mum and Dad said they're so impressed - mum sponsored u!". If I had a pound for every time that I said "People's generosity never ceases to amaze me" the fund would be over 100k by now. Thanks so much to everyone who has made a donation so far. Your money is so important to the 2 charities. I can't say often enough how important each donation is. Whether it be small or large it makes a massive difference. I've dumped all of the Tweets I received over the last few months to a file. When I get a chance I'm going to have a good read through them. There was so much to take in during the run and I'm really looking forward to reliving the journey through the eyes of my followers on Twitter. I've got a busy few months ahead with speaking engagements, The Great North Run, The Kielder Marathon, meeting Lady Elsie Robson and her family, kicking off the Entertainers ReUnited match and undertaking a feasibility study for the next big run to do. I'm also hoping to start running with the Tyne Bridge Harriers over the next few weeks. With the next big challenge in mind, I've got to look to take my running to a different level and having the company of some accomplished runners is going to be an important part of that. One thing that I'm looking forward to immensely is becoming an Ambassador for The Children's Foundation. I felt so honoured to be asked to become more involved in the work that they do. First up is a visit to The Great North Children's Hospital in September. This will be "a celebration of some of the equipment that The Children's Foundation have been able to put into the hospital.". I'm looking forward to meeting and being inspired by some of the other fundraisers who have also made such a difference at that event. Also in September, I'll be attending the Children's Foundation Star Awards. The awards aim to recognise the achievements of children in the North East with a disability, their friends and families, the challenges they face on a daily basis, reward their accomplishments and raise awareness of important issues to ensure equal opportunities. I'm sure that I won't fail to be inspired by the people that I encounter that night. Finally this year, I will be sitting on The Children's Foundation's Regional Small Grants Panel. This body of people are responsible for deciding which non profit groups will benefit from a grant of up to £1000. There will also be a chance to visit the groups after the awards to see how and where the money is being spent. As a fundraiser of 17 years, I will have never been so close to see how the money I've raised is being used. I find this to be a great honour and privilege actually. If I never had a hand in how money is spent or never received a thank you from the charities I raise funds for it would matter not. I raise funds unconditionally. I give my support unconditionally to the charities and expect nothing in return. This is something that I realised during the run across the USA. 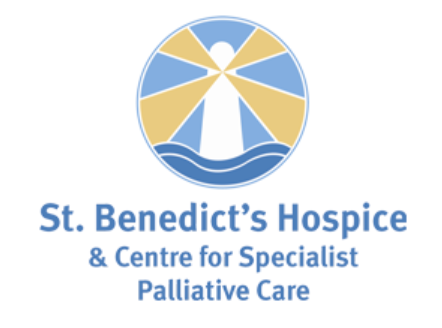 I have spoken on many an occasion just how I am forever in the debt of St Benedict's Hospice. They cared for my Mam during some very difficult times. As a then 23 year old, they answered my desperate call for help. The cancer from my Mam's lung had spread to her brain and as her days became numbered. Her body started to fail and the Hospice were there to lessen her pain and give her a dignified end to her life. I'm a firm believer that this kind of care should be available to all who need it. I'm an even firmer believer in the Hospice movement. 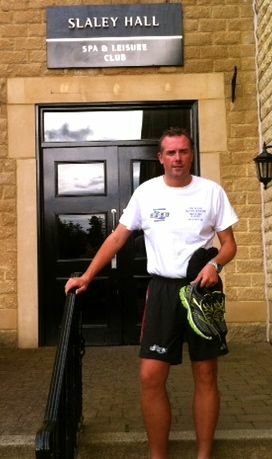 It is with that in mind that, as long as I can run, I will continue to raise funds for the Hospice. I'm also a firm believer that we must do everything we can to safeguard the happiness, health and safety of our Children. This is something that I've discovered as a parent but more so recently, having been made aware of the many projects that The Children's Foundation fund and are involved in. With the Run Geordie Run USA 2011 ball just around the corner and so many exciting things to look forward to, the fundraising circle is almost complete. 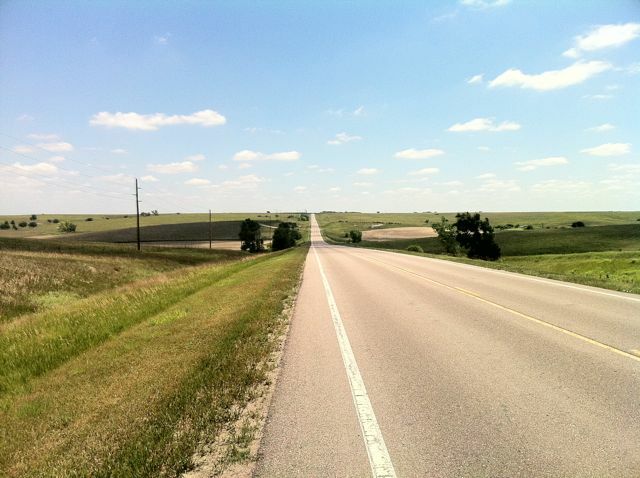 After having endured physical and mental pain on the run across the USA I'm now starting to cast my mind back to what I wrote on Route 36 in Kansas; "Think not about the finish line, nor the glory, nor the accolades. Think only about taking the next step to those ends". The run across the USA may be over and the charity fund at an unprecedented level. I now realise that I'm still nowhere near the finish line. There are still thousands of miles to be run. There are still thousands of pounds to be raised. There are still thousands of people to take along this journey with me. There is still the task of making my parents proud, wherever they are now. I'm not thinking about the glory or the accolades. My sights are firmly set on taking the next step. I'll be revealing where that next step is in the next few months so please stick around. Please continue to check the blog or send a message on Twitter or Facebook. With your help and support Run Geordie Run will continue to try and make a difference. We are all in this together and I can't do it on my own. Thanks so so much to everybody who has made a donation so far. 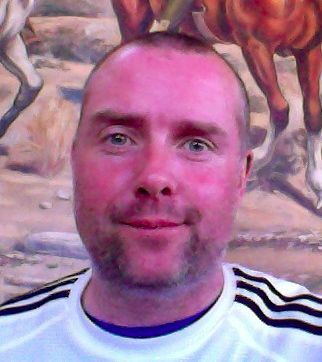 I am slowly getting round to thanking you all where an email address has been left on justgiving.com. The charity fund has almost reached £86,000. This is an amazing total so thank you again if you have contributed towards it. 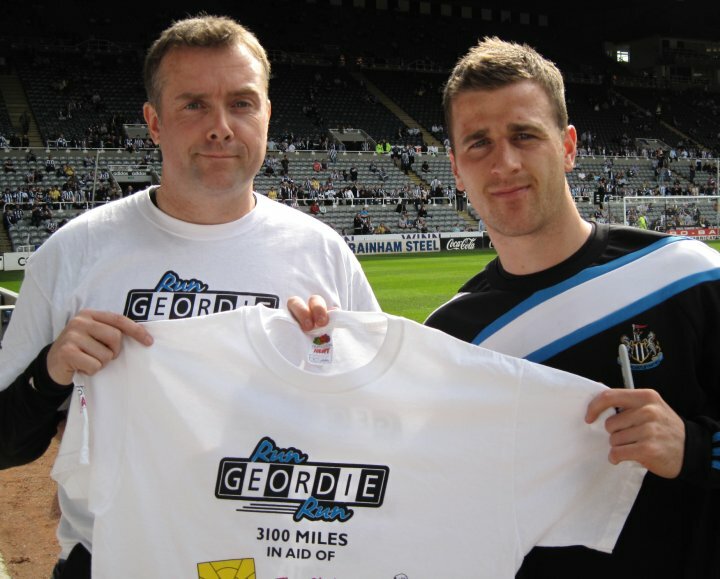 There are still vital funds to be raised right up until the Run Geordie Run ball in September. If you would like to sponsor my run across the USA then donations can be made in a number of ways. www.justgiving.com have introduced a brilliant new free donation method. Did you know that you can now donate to the 2 charities using your mobile phone? It's just less than 2 weeks to the Run Geordie Run Ball. I'm getting very excited about this chance to thank everyone for their support and talk about the bits of the run that, for one reason or another, I was never able to talk about on the blog. One example is the drugs bust in California that the Support Team were responsible for. I'm looking forward to telling everyone about how we tipped the police off and the subsequent arrests that were made. Ahhhh, happy days! 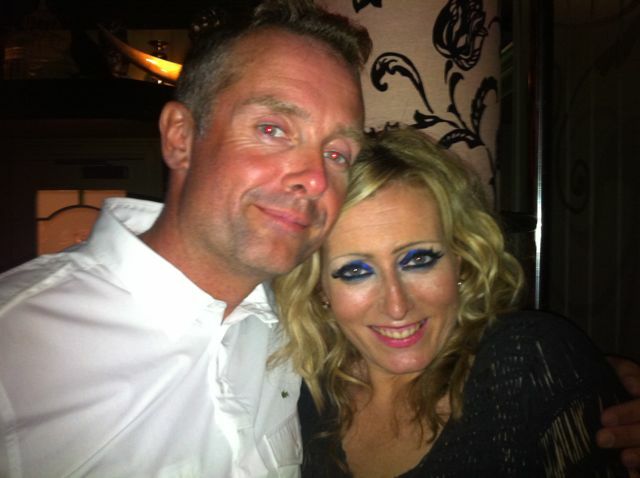 Gary and Lisa from the Real Radio Breakfast show will be hosting the ball. They are the perfect choice for hosts for 2 reasons. Firstly, they are obviously very entertaining. I've listened to them for over a year now on Real Radio and have had many a belly laugh on the way to work. Secondly, I spoke to Gary and Lisa on the show many times during the run. They know all about the highs and lows on the run and I'm sure that this will shine through on the night of the ball. I'm also looking forward to celebrating the run in style with the sensational Jason Isaacs backed by the Greg Francis Orchestra. Now that's a line up and a half ladies and gentlemen! Jason, the big band and the fabulous backing singers will be one of the highlights of the night for me. "Start spreading the news…..". Oh yes! I'll see you on the dance floor. As well as the usual auctions, games and emotional speeches we will be creating a mini Las Vegas casino for you to win your (virtual) fortune. I've got a good strategy on the Roulette tables so I hope to win big on the night. Tickets for the Run Geordie Run charity ball, which include a 3 course dinner, are £65 each or £600 for a table of ten. Please hurry if you would like to attend as tickets are selling fast. Please click the link below the poster to reserve tickets or please get in touch at sponsorship@rungeordierun.com if you have any questions. They say the that the worst kind of anti-smoker is an ex smoker. Not that I would know. I've never smoked and both of my parents, despite losing the battle against lung cancer, drummed it into me from an early age that smoking was a really bad thing to do. Having been overweight in the past, I've now been given the chance to get on my soapbox and try to inspire people to have a fitter and healthier lifestyle. 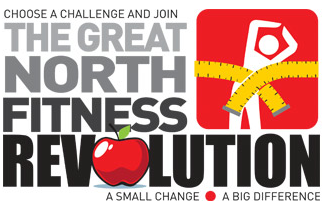 Last week I was asked to become an ambassador for The Great North Fitness Revolution. It's a campaign being led by the Journal newspaper. It has identified the fact that the North East of England is one of the unhealthiest regions in the UK. As a result, the campaign is trying to get the message across that an improved diet and taking regular exercise will change this fact. Their was a nice piece in The Journal yesterday about my involvement and thoughts on the campaign. As an added bonus, having the photos taken in Tynemouth last week was a nice excuse to go for a short run on the beach. I'm sure there are far more qualified and experienced folk out there for a role such as this. I'm not a personal fitness trainer. I'm not a nutritionist. I certainly don't have a relevant university degree. However, what I feel that I can bring to the table is that I'm an ordinary man in the street who has learned some very important lessons while undertaking an extraordinarily difficult task. I, myself, have struggled in the past with making the right food decisions. I've never struggled with being motivated to exercise though. During 100 days of running in the USA I really saw the real benefits of eating the right kinds of foods, in the right quantities, at the right time of day. One interesting and profound message that the Great North Fitness Revolution preaches is that by making small changes over time, a big difference can be made. One change that I'm making straight away is with my family. We were always big on puddings after a meal. Now when the old question of "What's for pudding?' is asked, the answer is "A walk!". There are plenty of lovely places to walk in and around Shotley Bridge, so we have no excuse as a family to get out in the fresh air. If you have been inspired by the run across the USA then why not think about how you could make a healthy change to your lifestyle. Why not involve your family too? There are so many small changes that can be made. 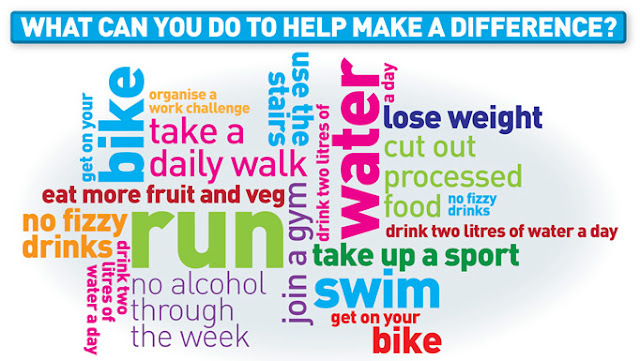 With a consistent and continued effort, these small changes can really make a big difference to a fitter and healthier lifestyle. To sign up to The Great North Fitness Revolution and find out more please click the image above. The dust is starting to settle a little bit on the run across the USA. I'm now able to begin the process of thanking all of those people who made a difference and gave both me and the 2 charities some great support. The first people I'd like to thank are the lads at nufc.com. Biffa and Niall have backed my fundraising efforts for the last 10 years. The quality and volume of coverage this time round was absolutely first class. Despite the run finishing 2 weeks ago there is still a piece on there regarding the up and coming charity ball. Being on nufc.com has enabled my efforts to become well known amongst Geordies the world over. It's absolutely no coincidence that this is where the vast majority of sponsorship comes from. One of the highlights of my day during the run was getting nufc.com's take on things. More importantly, the clever and sometimes funny headlines that they wrote were brilliant. 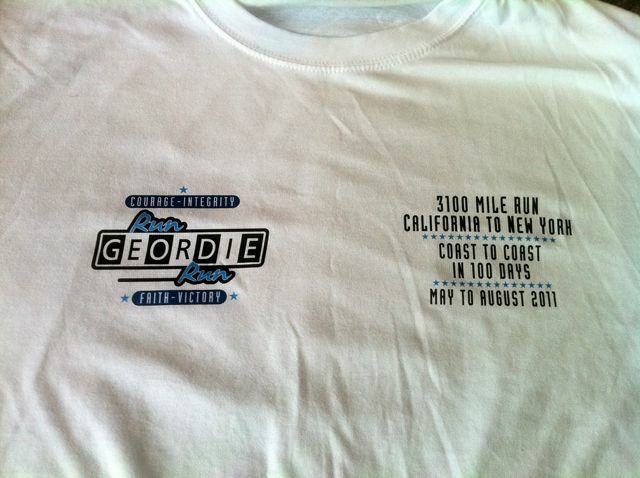 I'm currently looking into getting some new Run Geordie Run t-shirts printed to commemorate the run across the USA. Sales from the last lot of t-shirts raised over £8000 for St Benedict's Hospice and The Children's Foundation. Regular readers will remember when the Newcastle United first team warmed up in them before a match in 2010. I have a few designs in mind and McCowie and Co have agreed to pay for their production. This, as has been the case in the past, will allow the full amount paid for a t-shirt to go to the charities. 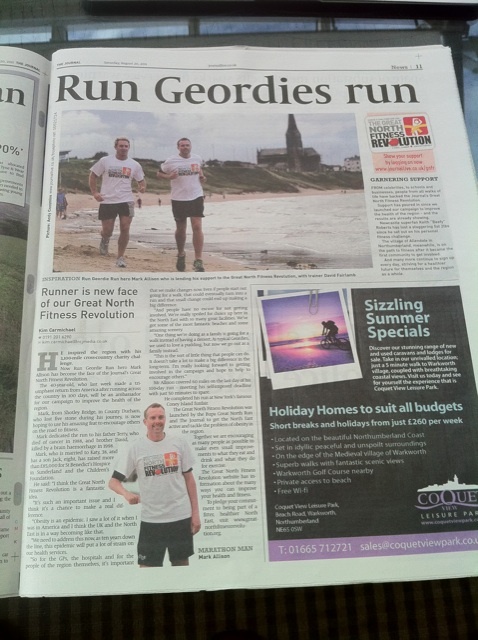 Watch this space for news on the new Run Geordie Run t-shirts and how to order them very soon. 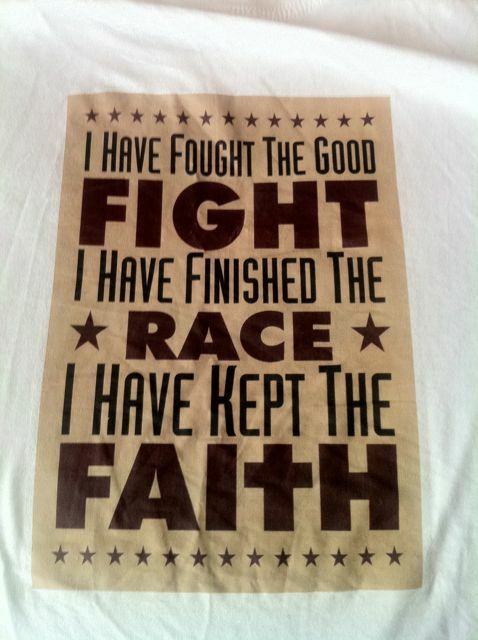 One design that was made into a t-shirt for my use in the gym last week can be seen below. A huge thank you goes to Slaley Hall for looking after Mrs Run Geordie Run and I this weekend. We had the pleasure of being greeted by MD Sean Boyce this afternoon and we've been made to feel very welcome. Sean is a fellow runner and ran in the London Marathon last year. We had plenty to talk about and he showed a very keen interest in my run across the USA. Our room here at Slayley Hall is absolutely fantastic and our lunch of Caesar salad (for the purposes of the watching Dave Fairlamb) was very nice indeed. We'll be dining in Duke's Grill tonight where the menu looks amazing. I might even treat myself to the Chocolate and Peanut Butter Cheesecake with sour cherries. Thanks to Catherine Harland, Sean Boyce and De Vere Slaley Hall for helping us wind down after the last few months of hard work in the USA. As an aside, I hear my personal trainer Mark Fleming is here playing golf today. Coincidence? Or has he heard that I'm fancying trying that Cheesecake? One week on and the charity fund is still going strong. It is now just over a week since I finished running across the USA. Naturally, the donations for St Benedict's Hospice and The Children's Foundation are coming in at a slower rate compared to previous weeks. Or so you'd think! The charity fund today burst through the £85,000 barrier and now stands at an absolutely amazing £85,212.56 (That's just over $140,000 USD). So many amazing donations have gone to make up that total and some big ones this week from The Holbrook Family, Gary Megennis, Martin Scott (who I got talking to on the flight back to the UK last week), Michael Gallon, Straightline Construction, Mark Howmans, Cathryn Hunt, the guys at Beach Bootcamp, Neil Porter, Ivor Potter, Keith Riley, Paul Connolly, Mohammad Mansoori, Nick Davison, Alexander Baker and the list goes on and on and on. It will take me some time to get round to thanking everyone who left an email address on justgiving.com personally. Please bear with me. I will get round to it. There are just so many of you! Fantastic! In other news, I returned to work today to an elaborately decorated desk. There were balloons, a nice banner and hundreds of photos of the run all over the place. It was a nice touch and I felt immediately welcome when I got back to the office. I'm very lucky to have a job after quitting my post to do the run. I had envisaged applying for jobs while I was running across the USA. To be asked to return to work the week before I left for the USA took a lot of pressure off me. I had my 2nd appointment at the Jesmond Clinic with Alison after work. She was very pleased with the recovery my feet had made to date and continued to do further chiropody work and massage on my feet and ankles. She thinks that I'm only a week away from running. I can't tell you just how much I'm desperate to get my trainers back on and hit the streets again. I've had some nice emails from a couple of running clubs this week. I'll be pursuing these with a view to getting some quality back in my running. It'll also be nice to have some company during my runs after work. Thanks also to those folk who have been in touch about after dinner speaking. I'm really flattered that people are keen to listen to what I have to say about the run across the USA. The first engagement that I have is at the Leisureworks Sports & Physical Activity Awards on the 16th September. Taking the audience on the journey across the USA in my allotted 20 minute time slot is going to be a huge challenge. I'm really looking forward to it and the fee that I'll be receiving will be donated to The Children's Foundation. Finally, thanks to everyone who has bought tickets for the Run Geordie Run Ball on September 3rd. Thanks also to the many companies and individuals who have donated a prize for the raffle and auction. Your help is greatly appreciated. For those who don't know, the event will be hosted by Real Radio's Gary and Lisa. The Run Geordie Run charity ball promises to be the homecoming of all homecomings. As well as the usual auctions, games and emotional speeches we will be creating a mini Las Vegas casino for you to win your (virtual) fortune. Not content with stopping at the bright lights of Vegas, there will be a hint of New York thrown in with our entertainment being provided by the North East's very own crooner Jason Isaacs and a full big band (with 3 lovely backing singers too!). Tickets for the black tie event are £65 each or £600 for a table of ten. Please hurry if you would like to attend. Click the link below the poster to reserve tickets or please get in touch at sponsorship@rungeordierun.com if you have any questions. 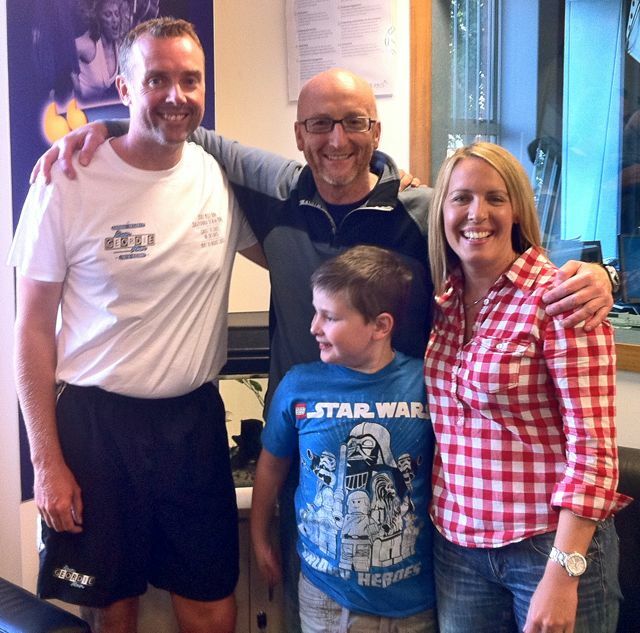 The Real Radio Breakfast Show with Gary Phillipson and Lisa Shaw have been so very supportive of the run across the USA. I spoke to the show every week during the run. In fact, I was either on the Breakfast show or the 3 Legends show (with Malcolm McDonald, Bernie Slaven and Micky Horswill) every day during the final week of the run. Like so many other people associated with this run, I’ll never be able to thank them enough for their support. The airtime they gave me and the chance to plug the run and the 2 charities proved to be so important. A huge thank you also goes to the programme controller Jon Kirby who, along with Gary and Lisa, really saw the potential in this run and backed me to the hilt right from the start. With that said, you may be able to imagine just how excited I was to appear on the Real Radio Breakfast Show yesterday morning. Firstly, the chance to thank Gary and Lisa in person was something that I’d been looking forward to throughout the run. As an added bonus, Katy and Jack were also invited onto the show yesterday. 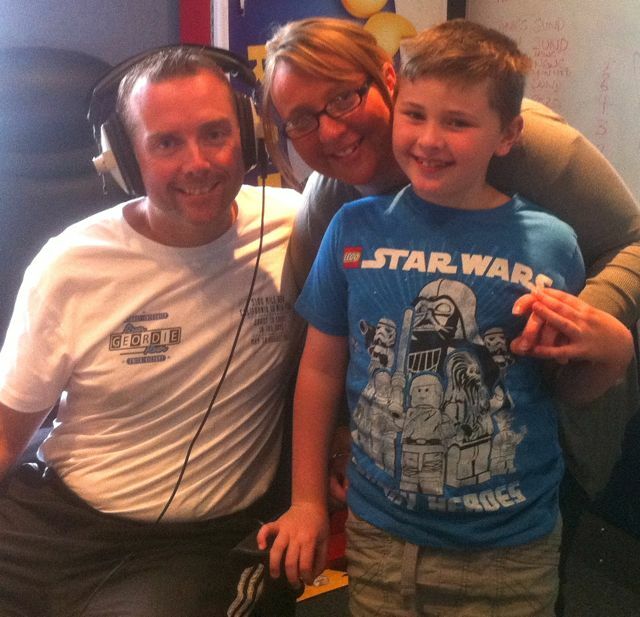 It was a great experience for Jack who enjoyed our time there from start to finish. To be able to share this time on the show with my family was something very special to me. 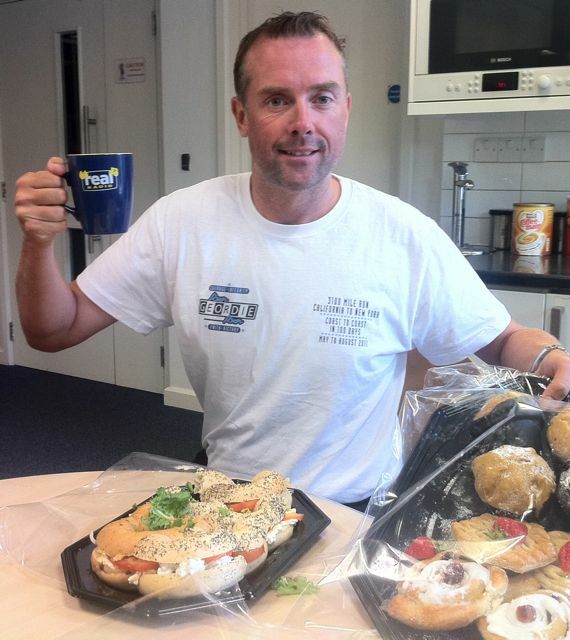 We were all very well looked after at the station. 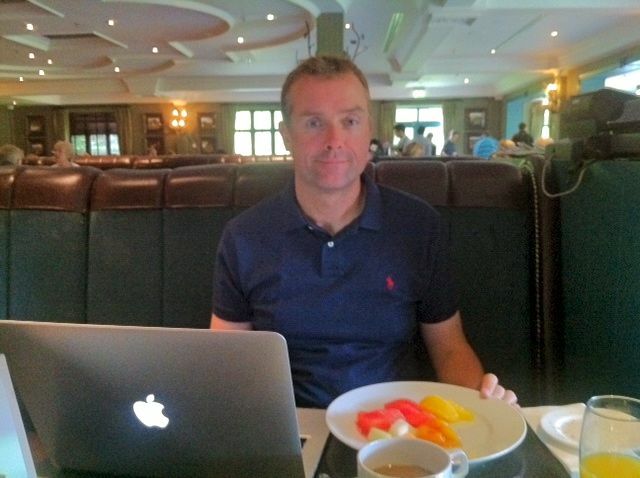 Before we started on the show, we had a spot of breakfast which was very nice indeed. 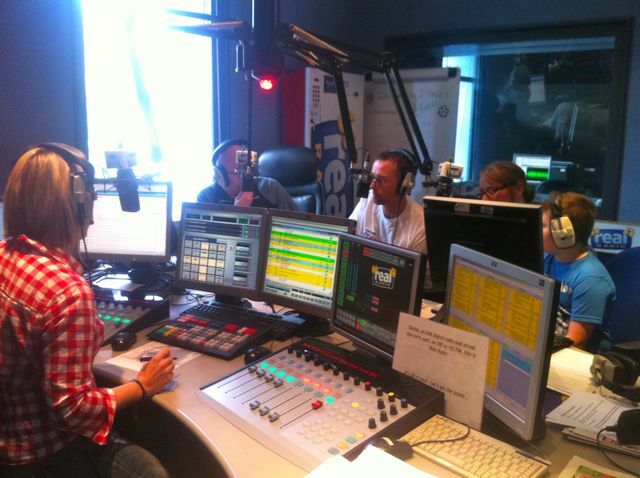 We were live on air just after 0730 all the way through to 0900. It was a privilege to be able to talk about so many aspects of the run, the support I had and the the 2 charities. Katy and Jack were also given a chance to give their point of view. As was the case on ITV last week, Jack was brilliant and charming in his own little way yet again. He even got to press some buttons and play his part on the Summer 0815 Vending Machine piece. Gary and Lisa were brilliant with him. He now wants to work at Real Radio when he grows up! What a brilliant experience for an 8 year old. For me, the highlight of the show was a "best bits" package that had been put together. I was absolutely gobsmacked and close to tears when I heard it. In my minds eye, I could picture exactly where I was for each audio clip. It was one of the most amazingly beautiful things that I've ever heard. It told the story so well in just 3 minutes. It's something that I will treasure forever. It can be heard here. Thanks to Real Radio, Gary Philipson, Lisa Shaw, John McInally, Jon Kirby, Chris Sibley, Trina O'Driscoll, Justin Lockwood, Craig Stewart and the 3 Legends for their invaluable help, support and encouragement during the run. 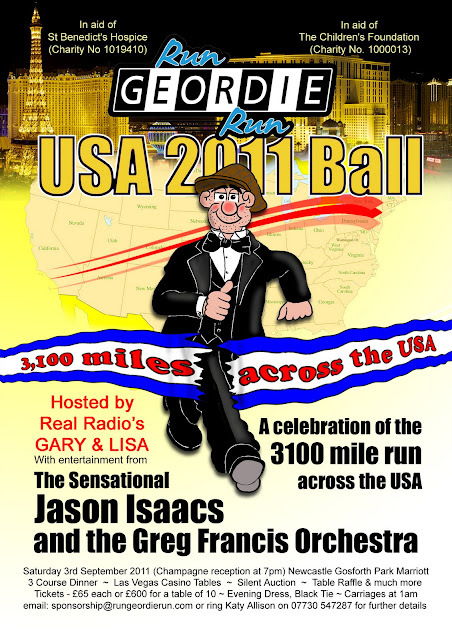 Hosted by Real Radio's Gary and Lisa, the Run Geordie Run charity ball promises to be the homecoming of all homecomings. As well as the usual auctions, games and emotional speeches we will be creating a mini Las Vegas casino for you to win your (virtual) fortune. Please listen out for me on Real Radio this morning as I'll be in the Breakfast Show studio with Gary and Lisa from 0730. It'll be great to be able to thank them in person for all the support they gave me while I was running in the USA. Also, thanks so so much to everybody who has made a donation so far. I will get round to thanking you all over the coming weeks where an email address has been left on justgiving.com. The charity fund has almost reached £82,000. There are still funds to be raised right up until the charity ball in September. If you would like to sponsor my run across the USA then donations can be made in a number of ways. www.justgiving.com have introduced a brilliant new free donation method. Did you know that you can now donate to the 2 charities using your mobile phone? 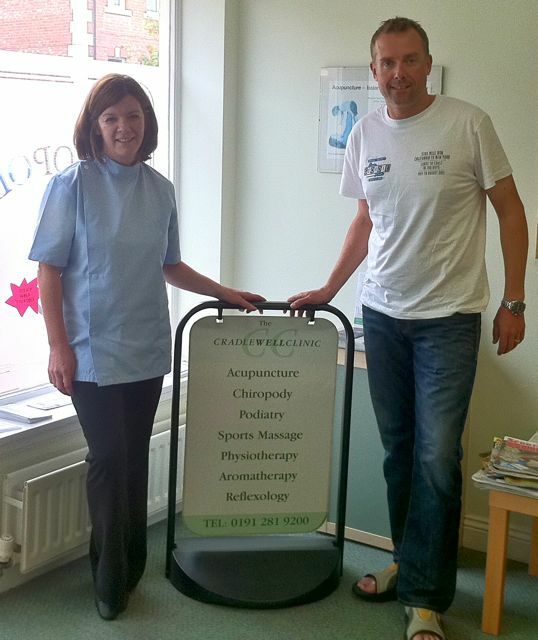 I've still got a lot of pain in my feet so I was very pleased when Alison at the Cradlewell Clinic in Jesmond offered to give my feet some much needed attention. I was there for almost an hour and, during this first session, a lot of dead skin was removed from my feet. I've got very sensitive feet but Alison and her very sharp scalpal handled them very well. Alison said that my damaged nerves will regenerate in time and that there is no permanent damage to my feet. That was really good news but it's going to take a few visits to get things right. Alison put dressings on my feet and showed Katy some massage techniques that she can use at home on my feet and ankles. It's a hard life! 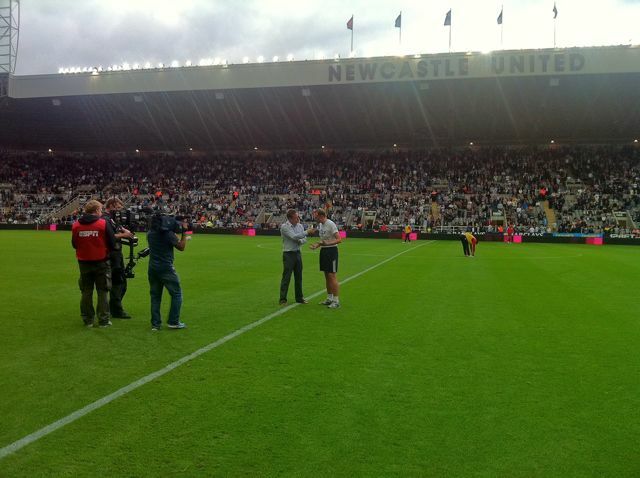 I was the special guest of Northern Rock at the Newcastle match on Saturday. Katy and Jack as well as Mark Fleming, Dave Fairlamb and support drivers Carlton Fletcher and Steve Harrison were also in attendance in a fantastic dining room inside the Milburn Stand. After 25 years of going to the match I have never been there in so much style. I was even allowed to park in the stadium! There was to be no mile long walk to Gateshead and back for me this day! The day got underway when we all went pitchside for some photos. Graeme Tones, Estelle Vasey and Louise Rourke were present from Northern Rock and really went out of their way to make everyone feel very welcome. As did Dale Aitchison and Olly Stapleton from the club who ensured that everything went well on the day. Before we sat down to eat in the Northern Rock suite, I dashed off quickly to the Bamburgh Suite to do a quick Q&A session with Ian Payne and John Beresford. Yet again, I really enjoyed talking about the run and there were a few hundred people in attendance. I had a fantastic meal before the match and we took our seats in plenty of time for the kick off. As I was walking to my seat a lot of people stopped me to shake my hand and congratulate me. At half time I was presented to the crowd by Justin Lockwood. The reception from the crowd was absolutely tremendous. 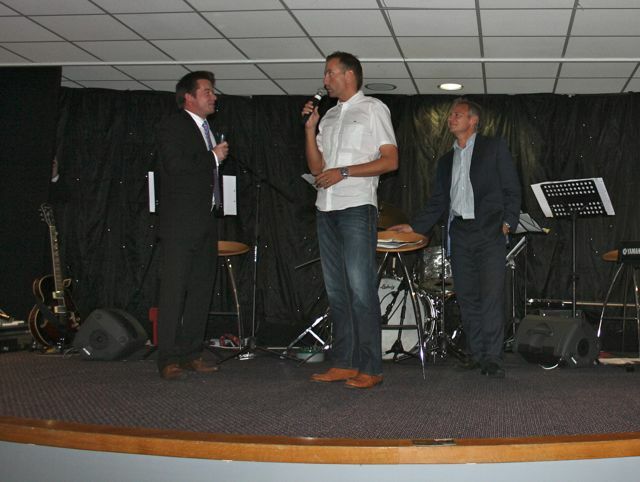 A quick Q&A followed as well as a plug for further donations and the up and coming Charity Ball. It was nice to speak to Justin and, just like his other colleagues at Real Radio, he has been very supportive over the last few years. 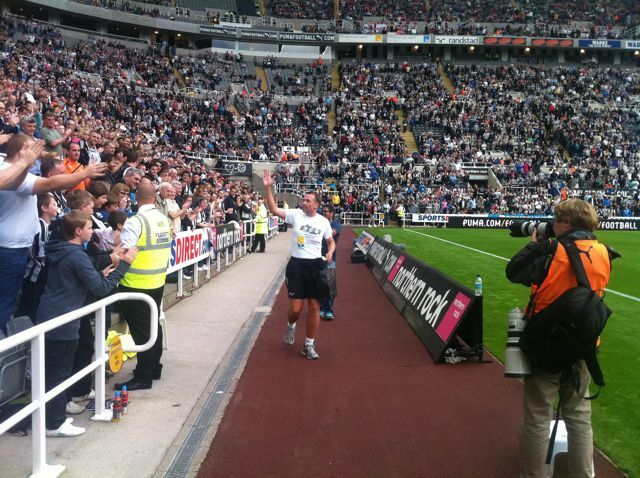 He later Tweeted "Honoured to speak to @rungeordierun on the pitch at St James' Park. A fantastic reception for a truly remarkable man.". I was presented with a signed Newcastle shirt with Allison 3100 on the back. That was a really nice touch. 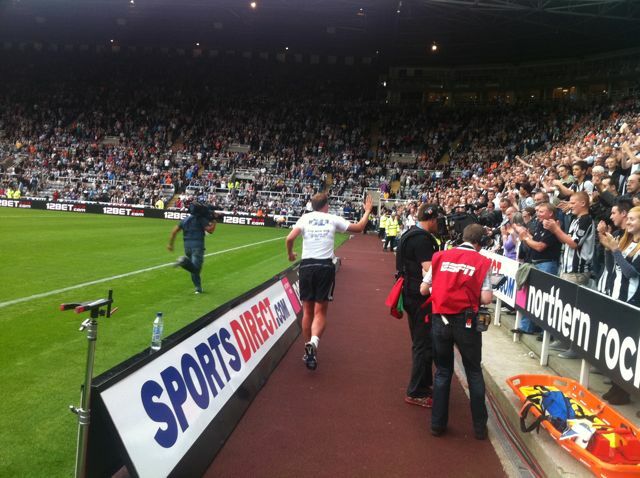 I set off running around the pitch with "Run For Home" by Lindisfarne playing over the PA system. I was really surprised to see how many people had remained in their seats at half time. I think I may have cost Mike Ashely a few quid in lost beer revenue! I tried to give as many people as I could a high five and I must apologise to any outstretched hands that I missed. There were thousands of them. As I ran round the pitch I was handed further donations. A grand total of £50 was handed over in total which was fantastic. I was also handed a couple of boxes of chocolates and a nice congratulations card. There was just enough time to sign a few autographs and the lap of honour was complete. Another truly memorable experience. 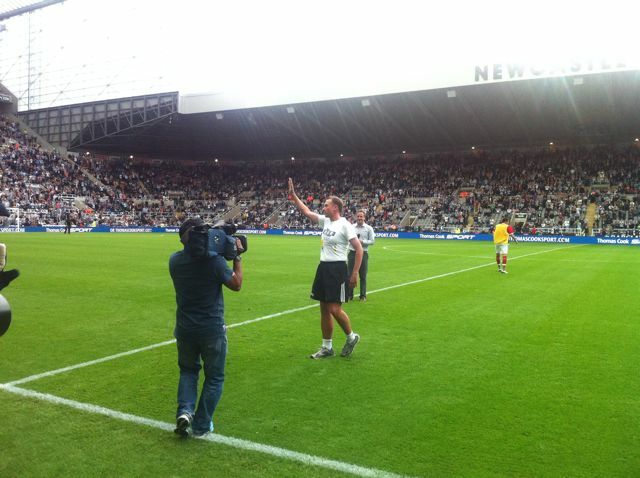 Phillippa Tomson from ITV tweeted the following about my lap of honour "It was the best bit of the afternoon". 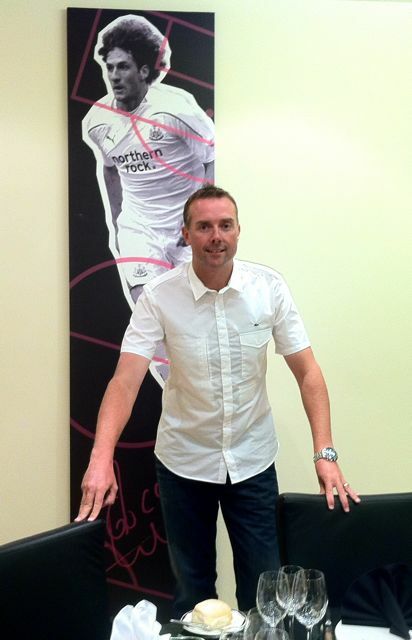 Thanks again to Northern Rock and Newcastle United for their hospitality and the kindness shown to my family and support team. After the match, Mark, Dave and I hit the town for a few "quiet" drinks. This is where it got really surreal as a lot of people came up to me to shake my hand and congratulate me. I remember Gary Phillipson from Real Radio saying that this would happen. I thought he was mad at the time. It happened in every pub we went into and it really made my night. I hadn't seen him since New York last week but I bumped into Dave McGregor from Real Radio. Also in the pub was Kellyanne Scott and they both had a lot of kind things to say. I think the evening's events came to a close at about 03:30. To say that I celebrated the run across the USA in style is an understatement. Beach Bootcamp on Saturday morning was an event that I'd been looking forward to for months. 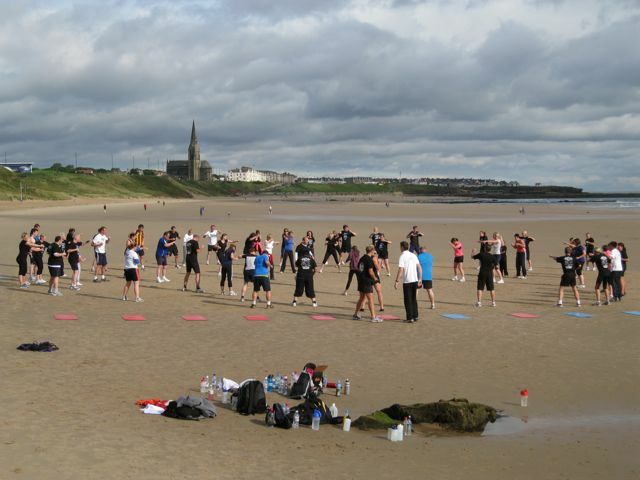 It had often crossed my mind while running across the USA just how much I was looking forward to getting on Tynemouth Beach and getting a good Beach Bootcamp under my belt. Dave Fairlamb had asked me to turn up 15 minutes into the session and I was very pleasantly surprised to receive a nice round of applause as I made my way down the steps onto the beach. Dave said a few words and then I gave a brief talk to the 70 or so people on the beach. It was a brilliant turnout! I talked about how Run Geordie Run may have just been 1 man running across the USA but behind that was all of the support, the donations and kind wishes that really made the whole thing possible and worthwhile. Bootcamp resumed for 10 minutes and then we held a Q&A session with Team GB's Olympic and Commonwealth swimmer Chris Cook leading the questions. This was a lot of fun and I spoke of one of the funny things that happened to support driver Carlton and I on the last day. It's not something that I can write about on this blog and it went down well. Chris Cook has spoken of just how much in awe he is of my run across the USA. I can't get my head around something like that coming from someone of his standing. 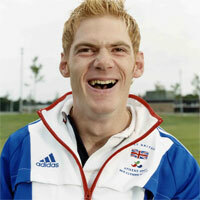 This guy has won gold medals and is awe of me! That kind of praise won't often get bettered in my opinion. The Bootcamp came to a close and it was great to talk some more to the participants and have photos taken. It was great to see Team Run Geordie Run's newest member, Beefy, who was being sponsored to lose weight. The company he works for, DH Fuel Services, has already got the sponsorship off to a great start with a £1000 cheque for St Benedict's Hospice. It was very nice to meet Diane Pringle who had been consistent throughout my run across the USA with, not only her messages of support, but with numerous donations too. Diane, who is now a Beach Bootcamp regular, is fundraising for a mental health charity and has raised a tidy sum with being sponsored to lose weight. I've got to say a huge thank you to David Fairlamb for putting on such a unique Beach Bootcamp. It was another event that I will remember and treasure. Finally, thank you to everyone who made a donation at Beach Bootcamp. A grand total of £403 was raised which is absolutely fantastic. Thanks also to the elderly lady who pulled over in her car and donated £12 saying "Were you on the telly last night?". There was a lovely couple too waiting to speak to me on the promenade and their £20 donation was very gratefully received. The day after. What next? Day 99 - Not for the faint hearted! Day 96 - Target hit! Target increased!